Recited at the beginning of each class. Students are encouraged to memorize the prayer. 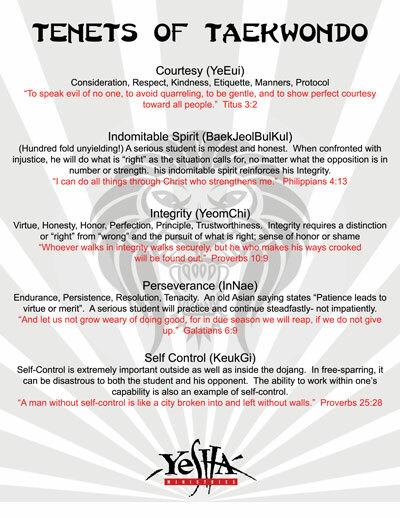 The Five Tenets of Taekwondo can be seen throughout the Yeshá Prayer. Courtesy, Indomitable Spirit, Integrity, Perseverance and Self-Control. Students are able to learn what the five Tenets are, what they mean to the Yeshá organization, and examples of how students can demonstrate them in their lives. Renewing membership, Uniforms, Student Handbooks, Sparring Gear and other Yeshá supplies can be purchased online at our Yeshá Store.